Before a satellite leaves the ground, technicians fill its fuel tank through a valve that is then triple-sealed and covered with a protective blanket, designed never to be accessed again. 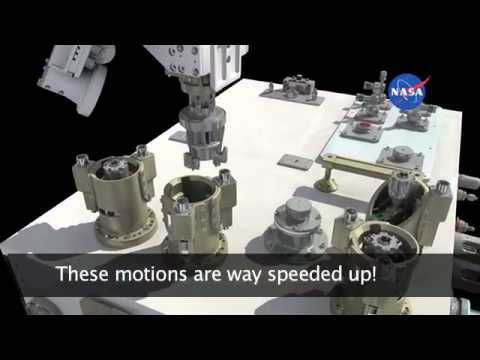 The Robotic Refueling Mission (RRM) is an external International Space Station experiment that demonstrates that a remote-controlled robot can remove these barriers and refuel such a satellite in space. RRM is the first NASA on-orbit demonstration of the technology needed to perform robotic refueling on spacecraft not built to be refueled. The shuttle Atlantis will deliver to the International Space Station a package of gear that will, later in the year, allow operators using the Canadian-built Dextre robotic handyman to explore new technology to someday repair or refuel satellites in orbit. RRM demonstrates robotic refueling technology and techniques using Dextre (the space station?s twin-armed Canadian robotic “handyman”), four unique RRM tools, and an RRM enclosure peppered with refueling components and activity boards. The experiment also demonstrates space robotic operations. RRM marks the first use of Dextre beyond the planned maintenance of the space station and uses Dextre for technology research and development. The aim is to increase satellites longevity, which will save many dollars.